The Sierra Nevada mountain range is linked to the administrative area established as a protected space belonging to the Southern Penibetic Systems of the Iberian Peninsula. 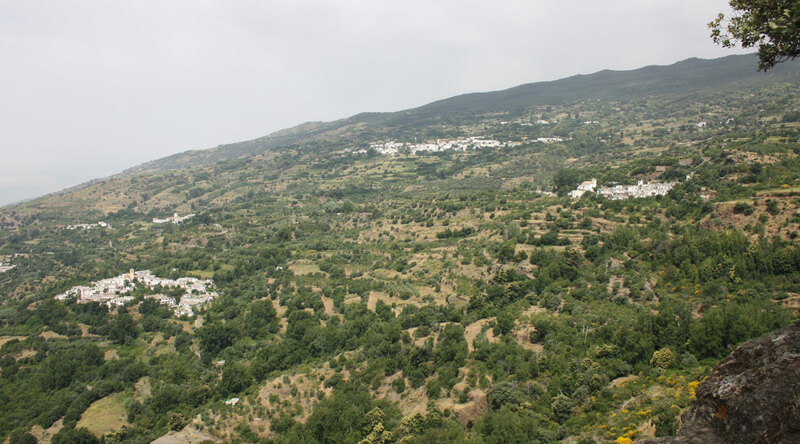 This protected area of Sierra Nevada, which includes both the National and Natural Parks and spans across the provinces of Granada and Almeria, -was categorized as Biosphere Reserve by UNESCO in 1986. Besides being the highest mountain massif in Western Europe, it also houses the southernmost sky resorts of the continent, with all the related problems in the management of resources that this brings to a protected area. Studies carried out mainly concern the environmental richness of these mountains: given its unique location it is one of the protected areas with highest biodiversity across Europe, and also a living laboratory where important researches are realised as part of the Network of Global Change Observation of Andalusia. The name Sierra Nevada comes from the Arab voice “Sulayr” translated by some authors as “Mountain of the Sun”. 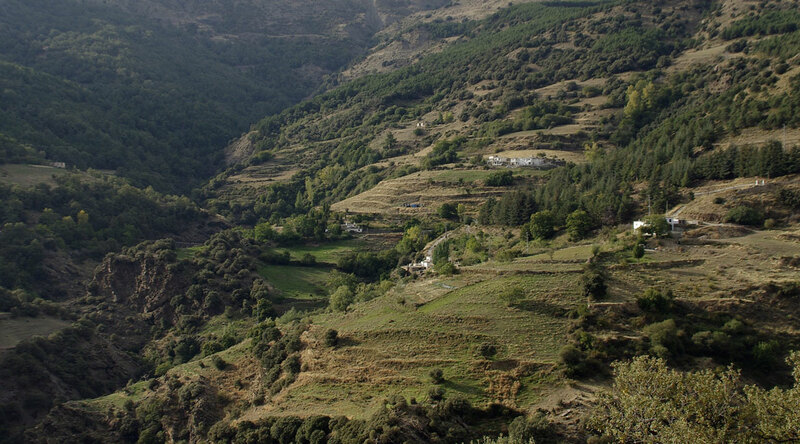 Sierra Nevada is a protected area that includes 61 municipalities which preserve most of their traditional architecture of mountain villages. This traditional architecture, together with the landscape formed by cultivated terraces and acequias deems this environment unique. The highest peaks of the Iberian Peninsula are found in Sierra Nevada: Mount Mulhacén (3.482 m) and Mount Veleta (3.392 m). Its terrain configuration possesses an extraordinarily interesting geomorphology interest due to the existence of its glacial and periglacial modeling, and, furthermore, its periglacial dynamics covering up to 2.500-2.600 meters range. 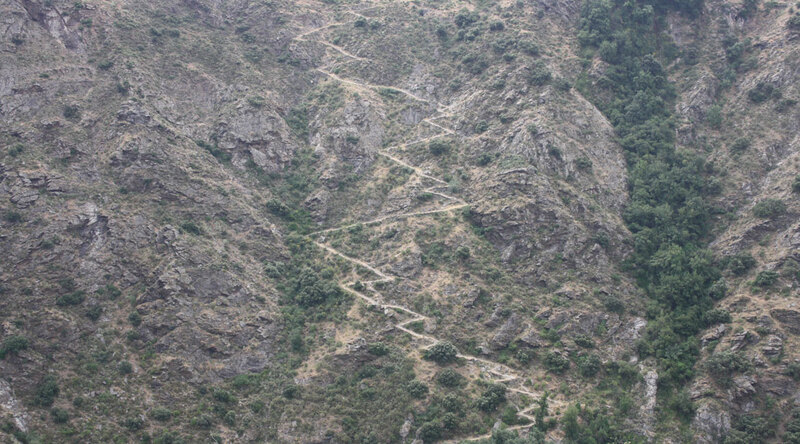 Erosion tracks can be spotted in the peaks, with U-shaped valleys, cirques crowned by steep mountains and lagoons filling the depressions. Over the peaks, precipitation reaching close to 2.000 mm provides a sizable snow layer, and therefore, a good reserve of hydric resources, fundamental for the developing of agriculture and human consumption. In Sierra Nevada, summers are smooth and winters are cold with frequent frosts. The hydrographic network is wide, and it is composed by numerous creeks, rivers and cliffs, -receiving supply from the snow and holding little water during winter, carrying a sizable flow during spring and beginning of summer. 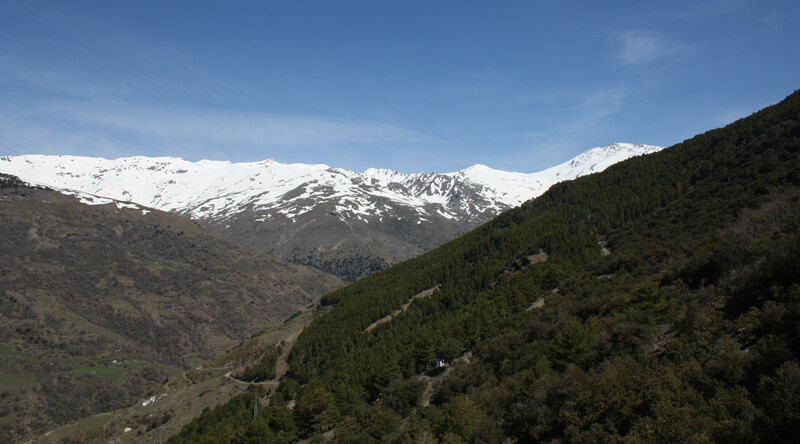 The biological diversity present in the high mountain range is the most important ecological asset of Sierra Nevada. There are a number of endemic species such as the Sierra Nevada Violet (Viola crassiuscula) or the Snow Star (Plantago nivalis). Near this range, outstanding valleys of glacial origin can be found, -by example Siete Lagunas. At middle altitude, these valleys dominate the landscape with deciduous forests composed by Pyrenean oaks (Quercus pyrenaica), Acers (Acer opalus), Cherry trees (Prunus avium) and Sweet chestnuts (Castanea sativa). There is a great number of endemic plant species: around 65 plant species restricted to this range, -and 175 species which are endemic to the Iberian Peninsula. The ecological importance of the whole massif has justified the need for its conservation and protection, through its categorization as Protected Natural Area.